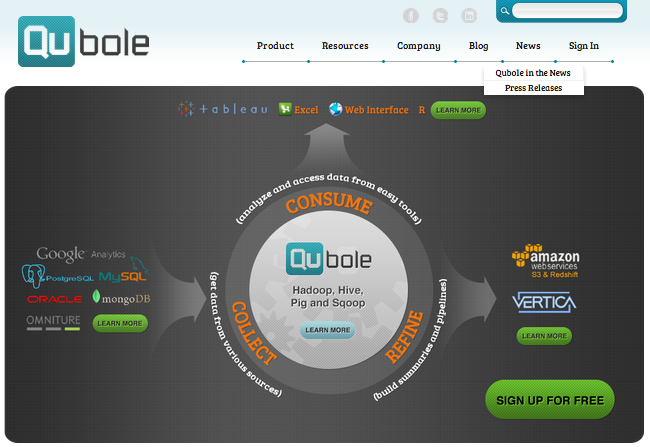 Bangalore and US-based Big Data startup Qubole Inc has raised $7 million in Series A funding from Charles River Ventures, an early-stage venture capital fund, VC firm Lightspeed Venture Partners, and angel investors Venky Harinarayan (founding partner of Cambrian Ventures) and Anand Rajaram (senior vice-president at Walmart Global eCommerce). The funds will be invested in marketing/sales and product development. The startup was co-founded by IIT-Delhi alumni Ashish Thusoo (CEO) and Joydeep Sen Sarma (head, Qubole India) in 2011. Prior to Qubole, they built and ran social networking site Facebook's data service. Thusoo also worked with companies such as Identity Engines and Oracle Corporation, and holds an MS degree in Computer Science from the University of Wisconsin-Madison (US). Sarma had earlier worked at Yahoo Inc, Network Appliance, Datsi Appliance and Oracle. He holds an MS in Computer Science from the University of Pittsburgh (US). The startup claims to have crossed a major milestone in processed data volume, breaking the half-petabyte (equal to one quadrillion bytes) mark since coming out of beta. The Qubole Data Service (the company's flagship) is now open to enterprises of all sizes and is offering free trial accounts for the same. Users can sign up for the service and begin running queries within minutes. "We have reached a critical point where our model has been validated by customers and investors alike. A half petabyte of data processed demonstrates Qubole's growth and viability," said Thusoo. Based on Apache Hadoop (an open source software framework that supports data-intensive distributed applications), Qubole Data Service is optimised for the cloud and focuses on making analytics easy and accessible to businesses of all sizes. The data engine enables users to integrate and consolidate data from multiple sources, and provides instant access through analytic tools like Tableau, Excel and R.
In addition, Qubole's self-service user interface makes it easy for analysts and data teams to combine, correlate and create actionable insights from their data assets. The startup caters to companies specialising in e-commerce, ad tech, web and mobile apps, and gaming, and some of its key customers are MediaMath, PubSquared and YdWorld. The company is currently building a new cloud-based data platform to solve issues regarding storing and managing data. It is also one of the 13 technology startups that have been selected by Microsoft India for its four-month long second incubation programme that started on March 1.